Secret gigs are always a funny one. Take our IITS True Skool x Music Potential showcase. It took place on a balmy Wednesday evening, and was an epic affair but one tinged with a little guilt because we couldn’t share the moment with the IITS faithful. For this exclusive event we grabbed the crew, packed up the kit and transformed an East London youth centre into an industry standard venue complete with bar, backstage, press junket and more flashing lights than Kanye could shield his eyes from. The occasion served as a graduation ceremony for the 80 MPX students who took part in Capital XTRA’s Music Potential 6-week intensive workshop, delivered by the IITS tutors in conjunction with Dv8 Training. 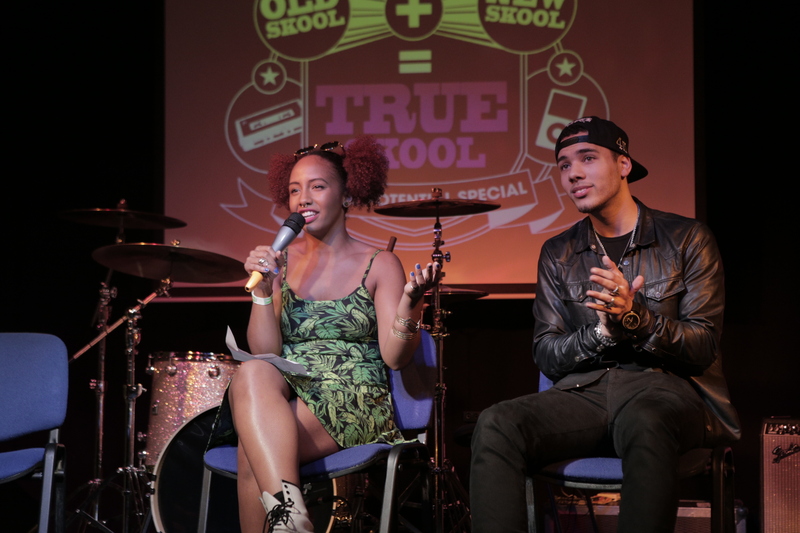 Young music business students, budding radio presenters and music producers were joined by tutors, project staff, media from Sky One, Evening Standard and a wealth of industry guests, to witness exclusive performances from this year’s emerging artists. The night saw the MPX Songwriters & Performers rise to the occasion, delivering great solo performances and demonstrating the power of collaboration. It’s humbling to know that the groups were formed, songs were penned, recorded in the studio, scored by the band and rehearsed in just 6 days! Alongside the MPX artists, Fusion & Mika held it down on the mic, interviewing select audience members and introducing Music Potential alumni poet Sian Gentle and the mighty Marika Diamond (Kass), who owned the moment with a Shirley Bassey-inspired performance. Salute to IITS tutors Wilder Jean, Jon Vears and Jammin for offering constant guidance, encouragement and support throughout the programme (not mention some masterclass performances). And we can’t forget the IITS band, who struck up a groove that carried us through the night and provided the soundtrack for success. To everyone who filmed, attended as industry VIPs (shout outs to Joel Compass, Jade Avia, Anna Carpenter, E+, Dave Wolfe et al), presented opportunities to young people, helped out behind the scenes and cheered on their peers, who took to the stage, we salute you for making this a very memorable occasion. And special thanks to Chelle and Alexis for their drive and vision, Brick PR, and Punch (for making down from B’ham to represent!). We look forward to the next stop on the Road to the Roundhouse, as the performers ready themselves to meet their public at Barclaycard’s British Summer Time in Hyde Park (July 10th) and eventually ‘unleash’ their potential at The Roundhouse (Aug 4th). True Skool returns Aug 9th, this time at the prestigious Rich Mix arts venue (put the date in ya diaries) and we hope to see you all there.